Callouts are short texts where you can describe the advantages or features of your product or service. These texts are displayed in an additional line beneath an ad. Callouts in ads can be served on both search and the ad networks (YAN and ad exchanges). In callouts you can list the advantages of your products or services, indicate special offers, or describe the benefits of working with you. According to Yandex's research, callouts increase ad CTR by 3%. Think up short texts to add to your ads as callouts. The same callout can be used in different ads and campaigns. Callouts can be added when creating or editing ads. You can do this on the ad editing page under Ad extensions, select Callouts → Add. Callouts must meet the moderation requirements. If a callout doesn't meet moderation's requirements, then it will be rejected and not served alongside the ad. The length of a callout should not be more than 25 characters including spaces. The overall length of a callout for one ad should not exceed 66 characters. Callouts can be displayed in any order. 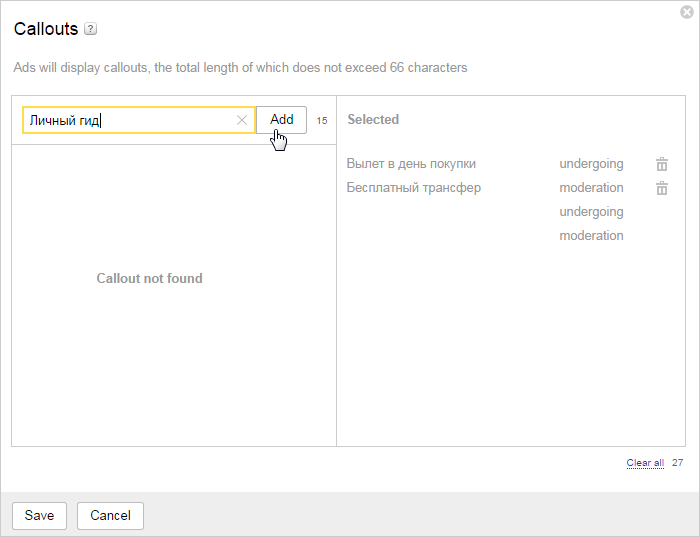 Yandex recommends that you keep callouts short and clear. Once created, you can add a callout to any ad in one or several campaigns. Callouts cannot be edited. If you want to change a callout, you need to delete it and create a new one. You can add callouts to multiple ad groups simultaneously with XLS/XLSX files, mass changes in multi-editing, Direct Commader or via the Yandex.Direct API.